Hopes classic 12-month wall calendar provides motivating tips and lively illustrations to inspire healthier lifestyle choices. Reviewed by credentialed experts. Monthly tips for quick wellness takeaways. BONUS! 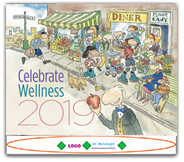 Free subscription to e-Bites, a monthly email featuring 5 full-color postcards that reinforce wellness, nutrition, fitness and safety themes from the calendar, plus a healthy recipe postcard. Great for sharing with your target audience! Content reviewed by Personal Best & Hope Health wellness board of advisers. Customization is one of the best ways to promote your organization's wellness initiatives and display important information relevant to your target population. Make your name, logo, URL, contact information or special messages visible for your employees or clients. Please call a Wellness Advisor at 1-800-871-9525 for more details. For any customization, please allow for later shipping dates. Imprint Area: Up to 1" x 10"
Please submit your logo as a JPEG, TIFF or EPS. We can not use GIF, PNG, PDF, BMP, MS Word or Publisher files. Your Calendars have been added to your Shopping Cart.